Rhys Priestland needs to "toughen up", says former Wales fly-half and captain Jonathan Davies after the Bath player's plan to take an 18-month Test rugby sabbatical was revealed. Pundit Davies, a legendary figure in Welsh rugby, also says Priestland will eventually regret the decision. The fly-half has been criticised by fans during his 40-cap career. "He does get a lot of stick, but he's got to take it on the chin and toughen up a little bit," said Davies. "Because if you're playing 10 and you are in the public eye, it comes with the territory so for me it's a strange decision and one that I think he will regret when he retires." 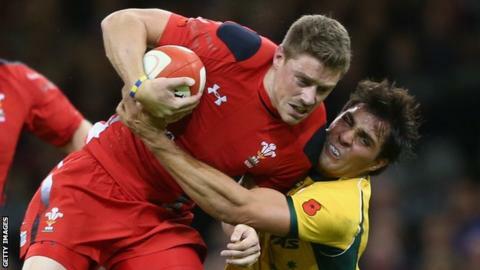 Priestland was booed by some Wales fans in their November 2014 defeat by Australia. During the 2013 Six Nations, Priestland admitted there were times when his confidence was so low he was reluctant to play. And in 2012 he said he had used a sports psychologist to boost his self-belief amid criticism on social media. Bath boss Mike Ford announced Priestland's stance after he made his Premiership debut following Wales' World Cup quarter-final exit. Another former Wales fly-half legend, Phil Bennett, believes Priestland has effectively ended his Wales career by deciding to concentrate on Bath after moving from Scarlets. Davies switched from rugby union to league and back again during his own outstanding career and "does not understand" Priestland's choice. "The only real beneficiary is Bath," Davies told BBC Radio Wales. "When I came back from rugby league I didn't really want to play for Wales because I thought I was finished. "But when the opportunity comes you have to cherish it because representing your country is the biggest honour that you'll ever have." Davies also feels Wales will suffer for Priestland's absence as he offers an alternative style to established fly-half Dan Biggar. "If he needed to come on with 20 minutes to go, he is more of a running threat and is more of a footballer than Dan Biggar," said Davies. "So it's a sad decision and it will affect Wales because they haven't got that strength in depth."